It's been a rough past few weeks for me, life just really hit me hard. All I really wanted to do was fall apart. I was prepared to stay in bed all day, watch movies, and eat my sorrow aways. However with some help from my friends and reading some bloggers motivational post, they convinced me that's not exactly what I should be doing and how unflattering that is. They definitely got me out of my slump, reminded me that even if it's raining now doesn't mean it's going to rain forever. Through the storm you can always find at least one positive thing. So I thought I share this quote because it's a perfect example of that. “When it rains look for rainbows, when it’s dark look for the stars” This is something I always have to keep in mind when I have really horrible day or week and I just want to give up. I have trouble with this every time I have negative thought, bad day, or something doesn’t exactly go the way I planned I think it’s the end of the world. However it’s not the end of the world, with the good comes the bad and we have to take it together. During our really bad days we need to try to be positive and instead of focusing on everything that went wrong we should try to focus on everything that’s good in our life. So what I didn’t accomplish half the things I was supposed to do today, maybe I got into an argument with my boyfriend, and so what life isn't what I planned it out to be. Nobody's perfect everyone has their bad days or weeks. I should be focusing on what I did get done from my list, the argument can be solved at least it's nothing too extreme, life is unexpected that is what's so great about it. When life gives you lemons make lemonade as cliche as that sounds, it's true. Everyone has at least one or meow positive things to be happy or thankful for, so when the rough time comes start thinking about all those positive things. I think this a key element in being happy. 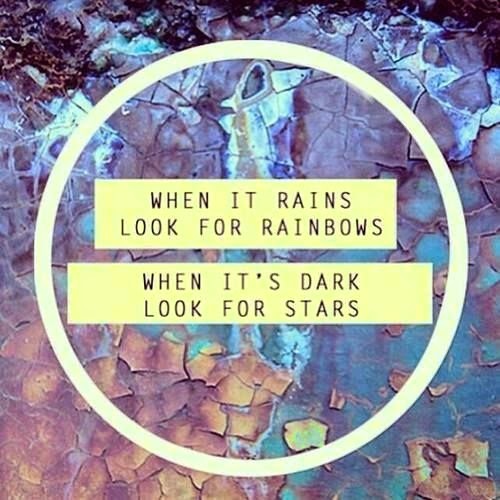 I don’t know about you, but I am going to try my hardest to keep this mentality up and always look for the “rainbow” when it’s rains and look for the "stars" when it's dark. How do you stay positive through the rough times?